Event Id: 37 Error Message: NeverfailMonitor: The following attribute failed its check. Attribute name. One of the attributes monitored by a Neverfail Application Module has exceeded its predefined threshold. When the monitored attribute 'Action' setting is set to 'Raise Event', and attribute performance exceeds the preset parameter, the error message is logged. Normally, this is an indication that the default threshold settings are not adequate for the environment. The WMI Service is not started on the server or working properly. Verify that the WMI Service is started and operating properly. Turn-off logging until you can adjust the threshold level. To do this, launch the Application Module Graphical User Interface by selecting Start -> All Programs -> Neverfail -> Configure Monitoring . To turn logging off until you can set it to a normal value, select the 'Services' tab and then select the desired service from the list of protected services. Change the 'Action' drop down from "Raise Event" to "Take No Action". The Neverfail Monitor service will no longer log these errors. The attribute monitoring triggers are configurable via the Application Module Configuration dialog for a specific application. Increase these values so that under normal operation no events are triggered. If the system is fairly heavily loaded during normal operation then additional memory/CPU power may be required. Note: Messages having EventID 37 seen regularly in the Application Event Log might highlight a problem on the server. It is recommended that, before reconfiguring the attribute threshold value, a check is performed in order to decide whether the attribute fails its check because of temporary problems (e.g. temporary increase in server activity) or because of a constant problem. To change the 'Action' settings for the 'System', go to Start -> All Programs -> Neverfail -> Configure Monitoring . 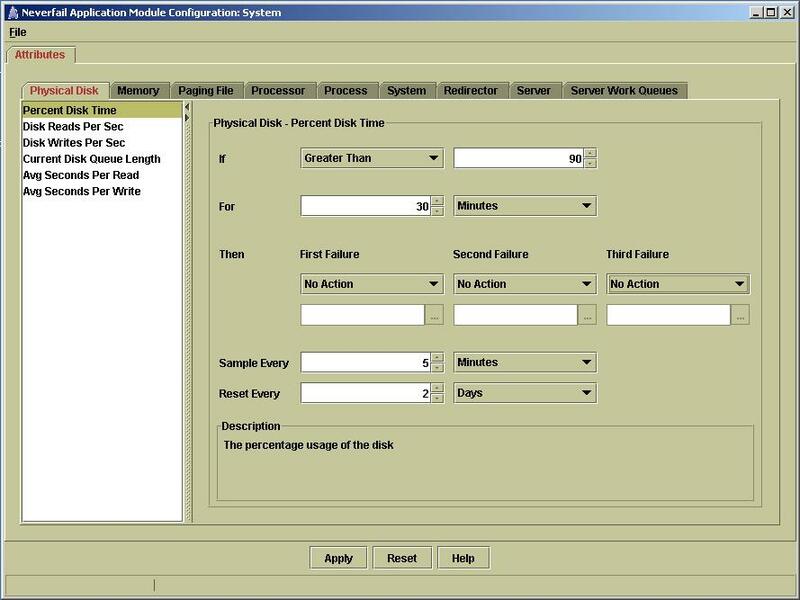 Select 'System' when prompted for the Application Module and on the 'Application Module Configuration: System' screen select 'Percent Disk Time' as indicated below. Under First Failure, Second Failure, and Third Failure, change the action from 'Raise Event' to 'No Action' as shown below or adjust the parameters as needed. Click on Apply and close the dialog. This will prevent the events from being raised until an appropriate time to adjust the parameters. Note: SCOPE can be used to determine normal operating parameters.